If you love crispy chicken sandwiches—and especially if you don't live in the West where this chain is located—you'll want to try out this clone of the tasty Carl's Jr. creation. The recipe makes four of the addicting chicken sandwiches from the California-based fast food chain, but will also come in handy for making a delicious homemade ranch dressing. 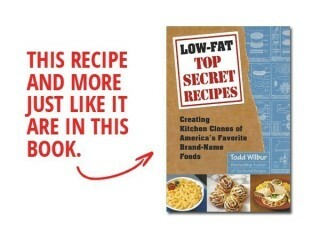 Try using some lean turkey bacon, fat-free Swiss cheese, and fat-free mayonnaise if you feel like cutting back on the fat. Helping Carl's Jr. rebound from its sales slump was a series of TV commercials featuring over sauced sandwiches that splattered ketchup and mayo onto floors, clothes, and shoes. 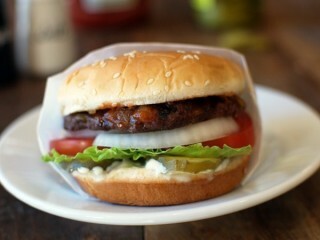 The tag line, "If it doesn't get all over the place, it doesn't belong in your face," made sloppy synonymous with tasty. If you look forward to messing up your clean clothes but don't need all the saturated fat that usually comes with this drippy fare, you'll want to give this clone a try. The fat-free ranch dressing saves you from oodles of nasty fat grams, and then the special baking technique that clones the taste and texture of deep frying eliminates a bunch more. Eight weeks after the board of directors locked seventy-six-year old Carl Karcher out of his office in 1993, he was engineering a takeover of the "Happy Star" company that he had built over five decades. Crafty Carl found financier William P. Foley to assume his debts in exchange for stock and take control of the company as the new chairman of the board. Carl was named chairman emeritus and finally got his desk back. His plan to sell Mexican food at Carl's Jr. restaurants was later adopted and became a huge success for the chain, and almost all of the executives who had fired him have since left the company. Here's one of Carl's delicious sandwiches that we can clone with much fewer fat grams by using turkey bacon, fat-free mayonnaise, and fat-free Swiss cheese. These substitutions for full-fat ingredients can bring the fat down from twenty-nine grams to just over ten without compromising that distinctive Carl's Jr. taste. In the last few years, Carl's Jr. has become one of the fastest-growing fast-food chains in the country. In 1997, the burger joint grew from 930 restaurants in nine states to nearly 3,900 in forty-four states with its purchase of Hardee's hamburger outlets. This makes Carl's Jr. the fourth-largest burger chain in the country, behind McDonald's, Burger King, and Wendy's. 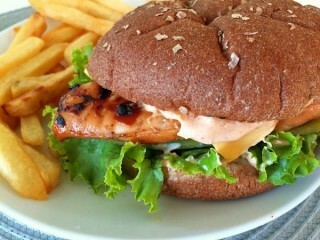 One of the unique sandwiches that makes Carl's a popular stop for the lunch crowd is this Charbroiled Santa Fe Chicken Sandwich with the delicious spicy sauce. It's that tasty sauce that give the real thing much of its fat, so by cloning it with nonfat ingredients, we can cut the grease on this sandwich to one-fifth of the original, while keeping all of the flavor. The first days receipts at Carl Karcher's just-purchased hot-dog cart in 1941 totaled $14.75. Peanuts, right? But Karcher was determined to make it big. So during the next two years he purchased several more stands throughout the Los Angeles area, later expanding into restaurants and diversifying the menu. In 1993, what had once been a business of one tiny hot-dog cart had become a multi-million-dollar company with 642 outlets. From $14.75 on the first day to today's $1.6 million in daily receipts, old Carl was on the right track. 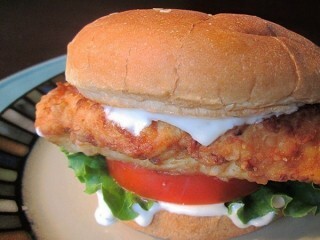 This fried chicken breast sandwich includes lettuce and tomato, and is slathered with a clone of Carl's tasty ranch dressing. 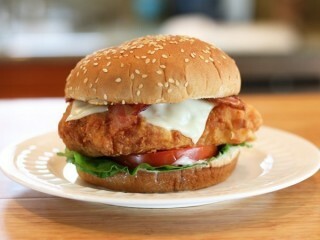 We'll use elements of the Carl's Jr. Bacon Swiss Crispy Chicken Sandwich clone recipe to whip up this variation of the Carl's Jr. crispy chicken sandwiches. Use both of these sandwich hacks to serve up two different sandwich clones for different tastes, with little extra effort. The 1980s were the beginning of tough times for one of the worlds largest burger chains. Carl Karcher had built the little hot-dog cart he purchased for $311 in 1941 into a successful West Coast hamburger chain 600 units strong; but his luck was about to change. Carl took his company public, then opened several Carl's Jr. restaurants in Texas. The bottom line for the Texas stores fell way below expectations, and the stock began to skid. In 1988 Carl was charged with insider trading for selling stock just before its price fell, and he paid almost $1 million in fines. When poor Southern California real estate investments left him million of dollars in debt, Carl was desperate to find a way out of the hole. He proposed to the board of directors that Carl's Jr. should sell Mexican food. The board voted to fire Carl instead, and the man with the vision was ousted from the very company he had founded. 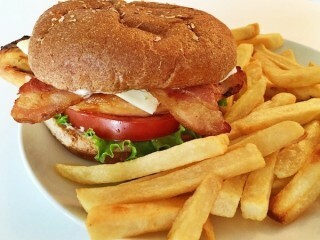 For this reduced-fat clone of an excellent chicken sandwich, well make the ranch dressing from scratch with fat-free ingredients. Then well use a special Top Secret Recipes baking technique of the fat we can't avoid when frying.